AV-8 series constant pressure valve can ensure a stable pressure at both outlet and inlet. It is widely used in separators, heat exchangers, tank systems and other equipments. It also can be used as a relief valve. Constant pressure valve is remotely operated by compressed air. The operation does not need any sensors; it only requires an air pressure regulator and a pressure gauge on pipeline for monitoring. A unique plunger design can make a rapid response to any pressure changes during the medium flow and changes stem position relatively to maintain the pre-set pressure. When the pressure increases, the valve opens; when the pressure decrease, the valve closes. AV-8 series constant pressure valve complies with DIN, 3A and ISO standards. 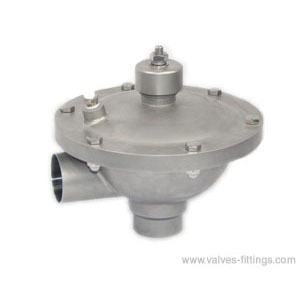 The valve includes a valve body with seat, valve bonnet, a stem with a diaphragm and a clamp. Constant pressure regulating valve's inlet is 90° angle to the valve bottom, so as to minimize residue and facilitate cleaning. The plunger design allows less liquid flow and higher CIP flow. DIN11850, DIN11851/ SMS/ 3A/ ISO etc.